Workers in Colombia are once again victims of armed violence for trying to exercise their right to join and be represented by a trade union. On January 5 the union at Nestlé Pantnagar, the company's largest and newest (2006) plant in the country, signed a first collective agreement on wages and benefits, joining its 3 sister unions in the IUF-affiliated Federation of All India Nestle Employees in finally winning the right to negotiate terms of employment previously declared "secret" by management. Nearly one thousand tea workers and their families continue to suffer collective punishment at the hands of India's Tata Group. Private equity operator Blackstone, "has good reason to be nervous about Hilton." They're not alone; the enormous leverage taken on to finance the buyout at the height of the debt bubble now weighs heavily on the more than one hundred thousand Hilton employees around the world, on the wider financial system, and on the US Treasury, and therefore US taxpayers. Here's why. In a major win in the closing weeks of 2009, unions representing more than 1,200 workers at Nestlé India’s factories in Moga, Ponda and Bicholim signed collective bargaining agreements on wages and benefits for the first time - marking a major achievement in their year-long struggle for the right to wage bargaining. The agreements also include wage scales and wage information that previously were declared ‘secret’ by management. UNISON members at the North Devon hospital Trust employed by Sodexo have voted by a massive 97% in favour of strike action over unpaid wages and conditions going back over 3 years to 1st October 2006. The strike is due to start at midnight on 4th January for 2 days followed by weekly action. 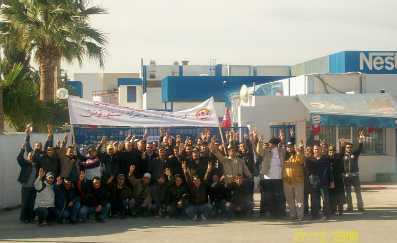 Update 1 Feb 2010: Negotiations have taken place between the Nestlé union and Nestlé Tunisia management under the auspices of the Labour Inspectorate. Details will follow shortly. Workers, their union and the Federation of Food and Tourism Workers of Tunisia (FGAT) are demanding to know the facts behind Nestlé's secret sale of an ice cream factory. 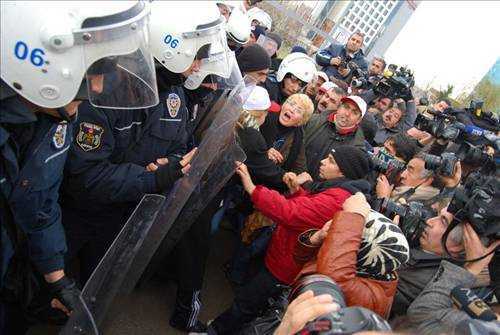 Workers, their family members and supporters have been demonstrating in near-freezing temperatures in protest against a snap government decision to close their workplaces at the end of January 2010. For more detailed information about any of these events, click on the event name.